The box art for the Nintendo 64 port. 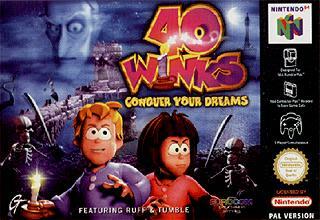 40 Winks was a platformer game developed by EuroCom for the PlayStation in 1999. While the game received mixed reviews, development on a Nintendo 64 port began and was set for a 2000 release date. The Nintendo 64 port of 40 Winks was very far into development having received a review from the Official. Nintendo Magazine. In late 1999, the publishers began debating whether or not they should release the game for the Nintendo 64, with IGN calling its future "uncertain." Ultimately, they decided against it, and the port went unreleased. The English, Spanish and Italian prototypes were released on a popular ROM-hosting website, and it can be discovered through a simple Google search. It is currently unknown why the game was canceled. As mixed reviews came in for 40 Winks, the parent company GT Interactive was starting to be affected by the commercial failure of 40 Winks on the PlayStation. In order to stay afloat, GT Interactive started to sell off assets and downsize the development team working on the Nintendo 64 port. Despite all of these efforts, the port was canceled in 2000. On February 12, 2018, Piko Interactive launched a Kickstarter to officially release 40 Winks on the Nintendo 64. The Kickstarter reached enough backers to meet the deadline and get 40 Winks released on the Nintendo 64, Microsoft Windows, and Steam in November of 2018.